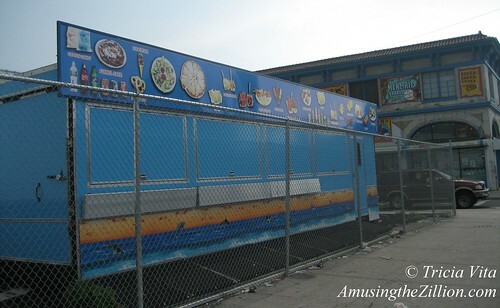 Over the first weekend of summer, a few more Coney Island businesses opened their doors. As we reported on Saturday, Grimaldi’s new pizzeria on the north side of Surf Avenue served its first pies in Coney Island on Mermaid Day. Across the street, Luna Park’s new state-of-the-art arcade, which takes only Luna cards–no spare change, please!– opened in the former Astroland Arcade. The surprise of surprises was to see Cha Cha’s Steeplechase Park open for business after a four week delay. The Coney Island Rumor Mill had been speculating that the park, which was scheduled to open on Memorial Day Weekend, would never open. The Rumor Mill was wrong. Jonathan Gordon, the designer of the MegaWhirl, a prototype ride that is the centerpiece of Cha Cha’s Steeplechase Park, told ATZ that the delay in opening the park had nothing whatsoever to do with the rides. It was a matter of filing of paperwork with City agencies and bureaucratic red tape that kept the park from opening until now. Friday’s ride inspection by the City’s ride inspector was cut short by a torrential rainstorm, but they received a checklist of what needed to be done, Gordon said. The inspection resumed on Saturday afternoon after the Mermaid Parade. The MegaWhirl and the majority of the other rides, including a Scrambler, Himalaya and Bumper Cars, passed inspection on Saturday and opened on Sunday. Only the Cobra and one of the kiddie rides need additional work before they’re ready to open. The cost of a single ride on the MegaWhirl is $5, according to Gordon. 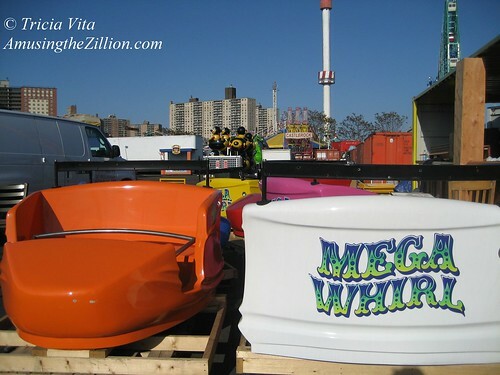 In early May, the ride designer and the manufacturer Larson International brought the MegaWhirl from the factory floor in Texas to make its world debut in Coney Island. 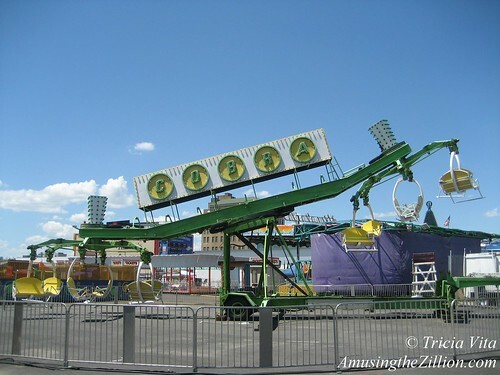 As previously reported, the ride combines the thrill of the Tilt-A-Whirl and the Whip. The new ride’s arrival is another promising sign of Coney Island’s revival. Back in the day, the first models of new park or carnival rides would make their debut here. The opening of Cha Cha’s Steeplechase Park marks the return of rides to Thor Equities’ Stillwell Avenue lots for the first time since July 2008. Amusements existed here for more than 100 years until Joe Sitt bought the property and booted longtime ride and game operators in 2006. 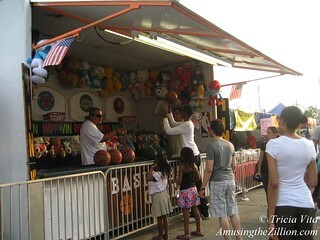 The Thor-owned Stillwell sites were used for a carnival in 2008, a flea market in 2009 and 2011, and remained vacant in 2010. On Saturday, the flea vendors of the BK Festival on the west side of Thor Equities’ Stillwell lot were once again doing business. On the east side of Stillwell, Cha Cha’s new outdoor Club Atlantis Bar was serving customers. 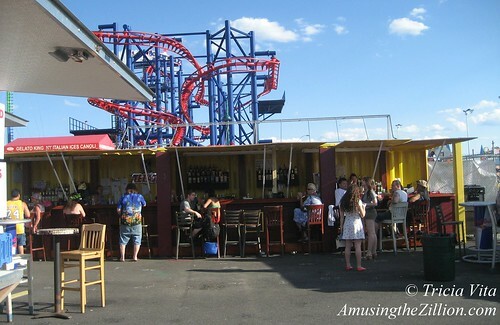 Adjacent to Wonder Wheel Way and Scream Zone, the bar has a lot of space for table seating. It combines elements of Cha Cha’s former Club Atlantis on the Boardwalk with Beer Island minus the sand — for now. 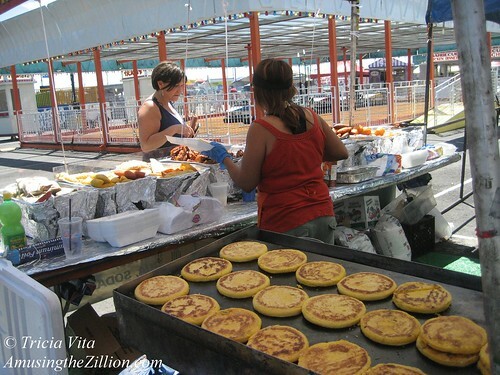 Also open were a variety of food stands of the type one finds at street fairs. The food looked appetizing and less pricey than similar fare at Nathan’s. After seeing a friend enjoying a chicken shish-kebob, we tried one for $5 and would eat there again. Oddly enough, shish-kebob has been eliminated from the menus of the Boardwalk eateries Paul’s Daughter and Ruby’s Bar. The only other places you can get it in Coney Island are Gyro Corner, which has a location on the Bowery, and Pete’s Clam Stop on Surf. Sadly, two Coney Island veterans previously displaced by redevelopment will not be able to open their businesses anytime soon. Ray’s Basketball, which is on the Steeplechase lot facing the Bowery, and Steve’s Grill House, currently on Thor’s 12th Street lot, got new locations that have literally left them up against a fence. The original plans for the new Steeplechase park and two satellite locations on Surf Avenue called for opening the fencing during business hours. It turns out that city regulations will not permit it. Steve Bitetzakis’ Grill House has lost its location twice in the past year. On the Coney Island Boardwalk since 1993, Steve’s was one of the “Coney Island 8″ evicted by Zamperla. In February he sold his modular building to Zamperla, which is remodeling it and the former Beer Island to create the Place To Beach Bar. After purchasing a concession trailer, Steve’s opened for Easter on Thor Equities’ Stillwell East lot leased to the BK Festival. He lost his spot and was relocated to Surf when the festival closed to make way for the new Steeplechase Park. Ray’s Basketball, which was moved from the Coney Island Arcade lot, is not on wheels and would require a crane to pick it up and turn it around 180 degrees. Anybody want to help these guys out? Yay for Ray! His basketball game is no longer “fenced off” and will be able to do biz on 4th of July. Ray finally managed to open on Friday, June 29, for the first time this season after the chain link fence next to his awning was opened. 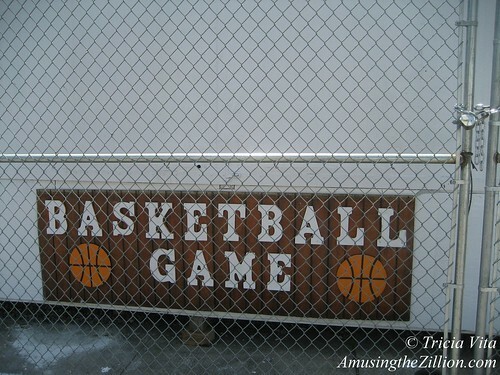 Note the portable fencing placed in front of the basketball game, probably as per the letter of the law. Steve’s Grill House and the West 12th Street lot remain closed. on June 28, 2012 at 9:30 am | Reply jack b. Intended to leave a reply earlier. Thought this report on other goings on during Meramaid Parade day was exceptional. We were there and this information explains why some of the rides were not open on Saturday. Also, we enjoyed the other “new re-openings”. Real good job Ms T.
Thank you, Jack! Sorry to have missed seeing you on Mermaid Day.